The struggling Defender crossed the finish line flying a protest flag—5 minutes 26 seconds in arrears in a graying twilight, temperatures dropping (what, you forgot gloves?) —but the second and final race of the 33rd America’s Cup match will be remembered as a second drubbing by the high-tech challenger of a team that lost the design contest a long time ago. The evidence builds that these two boats could meet any number of times, and Larry Ellison’s trimaran, USA, would just keep on pounding Ernesto Bertarelli’s Alinghi 5. 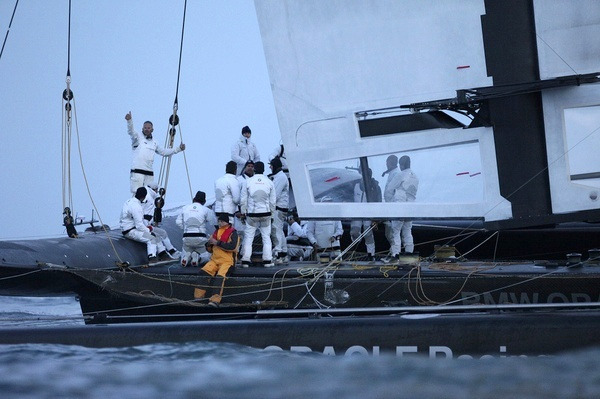 The protest was dropped within minutes of Alinghi’s finish. Horns are blaring and helicopters are rattling. That’s the sound of America’s Cup. Can I remember an America’s Cup race where flash bulbs illuminated the finish? BMW Oracle Racing today put up a “just in case” tent on the tarmac dockside at their team base and, thinking ahead, dropped containers at strategic spots so they could throw open their doors to the public without literally throwing open the doors. Everyone else is going to say it, so I’ll join the chorus, Happy Valentine’s Day, Larry Ellison. Happy Valentine’s Day, Golden Gate Yacht Club and Commodore Marcus Young. Happy Valentine’s Day Russell Coutts, still the winningest Cupper ever, still undefeated, and now with a fresh scalp on his belt. Happy Valentine’s Day Jimmy Spithill, a winning skipper and driver at age 30. With nearly three years of litigation under the bridge, the second-ever Deed of Gift match becomes the first case in which the Challenger wins, and BMW Oracle Racing team owner Larry Ellison was aboard to savor all 39 measured miles of the old-school triangular course prescribed for Race Two by that old-school Deed of Gift. Though he probably enjoyed the second and third legs more than the first.
. . . in the Cup’s historic waters of Newport, Rhode Island.
. . . in 2013, 30 years after Dennis Conner’s Liberty lost to the wing-keeled wonder, Aussie II. Commodore Young has allowed a few comments regarding a lack of infrastructure back home on San Francisco Bay, so he may know something we don’t know for sure. Ellison has long said that there should be a long runup to Cup competition, with teams traveling and competing and showing their colors in many places, and in that scenario, San Francisco does not lose out completely. This conversation always includes a reminder that Ellison recently bought “the Astors’ Beechwood,” a kingpin mansion on Belleview Avenue in Newport and perhaps an ultimate address for defending AC 34. I give full marks to Ernesto Bertarelli for showing up at press conferences following painful losses, and for taking the helm of his boat to cross the finish line for the official loss. I figure he’s stunned, but that’s upright behavior even if he still can’t seem to wrap his mind around the fact that the July, 2007 protocol was a problem, and everything went downhill for him from there. So, not to beat a horse in pain, but here we go. Once again Alinghi put on an amateur hour performance at the start. Bertarelli and tactician Brad Butterworth were caught inside the starting box at the five minute signal and there’s a penalty for that. You don’t do that because it’s so easy not to. Just be some place else. In any match race, a penalty is huge. When you’re sailing a beast as ungainly as a catamaran 110 feet overall, 90 feet on the waterline and needing probably two minutes to effect a penalty turn, “huge” matches the size of the boat. But they didn’t look the same. Alinghi 5 seemed a different boat in Race Two, I’d say, different enough to take the lead when Brad Butterworth as tactician chose the right-hand side of the course, where he was inside on the shifts and getting the puffs first. Turnover number one: Alinghi 5 comes from behind and passes USA early in leg one. At one point Alinghi was 600 meters ahead and moving well enough through the water to justify that. What I mean is, a lot of Alinghi’s gains had to do with positioning relative to the shifts and the puffs, but unlike what we saw in Race One, the catamaran’s speed was competitive enough to make the shifts and puffs count. A little leftie helped USA. Another rightie helped Alinghi. Except for a couple of tacks early on—including a sequence at about 4:20 into the race, where USA was unable to cross and tacked to leeward—the leg was essentially a drag race. Alinghi 5 flew a hull more consistently than in Race One but still hobbyhorsed more than USA. Alinghi owner Ernesto Bertarelli steered part of the leg but also passed off the helm to Loïck Peyron, whose résumé includes 18 solo Atlantic races. For a while, they looked good. USA took a chunk out of Alinghi’s lead as both closed on the layline to the weather mark, and the American tactician, John Kostecki, made a decision that getting to the layline first would be the key to the rounding. He had that right. USA, trailing, got to the layline first and tacked to converge with Alinghi 5, which came on with starboard-tack rights. Alinghi was ahead far enough to clear but not far enough to attack: that is, not far enough to tack on USA‘s line. Had they made that move there would have been a foul or collision-and-foul. They would have been obligated to leave room to keep clear, and they lacked that room. So Butterworth held them on starboard above the layline, then tacked, as USA continued on and sailed straight through into the lead. Turnover number two, right there, but it all depended on holding the layline, and USA did that. Now we were into the two reaches of the triangle, which, in sailors’ parlance, are “a parade.” It’s hard to pass on a reach. And so it proved. A faster boat in Alinghi’s position might be able to come from behind, but whatever mojo Alinghi showed on the opening leg evaporated on the reaches. USA went from a weather mark lead of 28 seconds to a lead of 2 minutes, 44 seconds at the wing mark, with Alinghi 5 still dragging a penalty behind it. A twelve percent difference in performance, that, and the BMW Oracle engineers have been saying they could find another 20 percent, given time. Time they don’t need. Now you can say it, Mission accomplished. 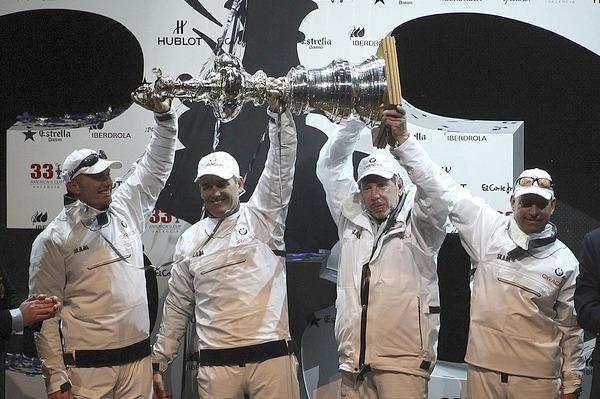 USA has returned the America’s Cup to the USA. It departed our shores in 1995, when Russell Coutts (with Brad Butterworth on tactics) won the Cup from San Diego Yacht Club in the name of the Royal New Zealand Yacht Squadron. Could Golden Gate Yacht Club Commodore Marcus Young, when he first joined that happy little club on the shores of San Francisco Bay, ever have imagined such a heady day as being on the waters today off Valencia, set to receive a hip pocket challenge from (we are quite sure) the Mascalzone Latino Audi team of Vincenzo Onorato? Could there ever be a smaller space on a boat than in the salon of the Race Committee boat in AC 33 with BMW Oracle’s rep Tom Ehman and Vice Commodore Fred Meyer, the rep for La Société Nautique de Genève? These two have been cara a cara, face to face and head to head, in the legal maneuvers of the last three years. Meyer objected to even allowing Ehman to step aboard on the day of Race One but was overruled by PRO Harold Bennett. Imagine ice drops forming on the ceiling. That Bertarelli could farm-grow a compliant “challenger” and take charge of the challenge eliminations process without a contest. That when Ellison and a group of other would-be challengers offered a compromise in October, 2007essentially, again, offering to revert to the 2007 protocolBertarelli could afford to refuse and take his chances in court. That he wouldn’t have to quickly build a giant multihull defender at all. Or, when he saw that it was coming to that, he could get by with “simply” scaling up one of his cats that had been successful on Lake Geneva and then take the event to the light winds of Ras al Khaimah in the UAE. That he could just keep talking around all of this, and no one would notice. Going down the second reach, the USA team may have throttled back slightly. 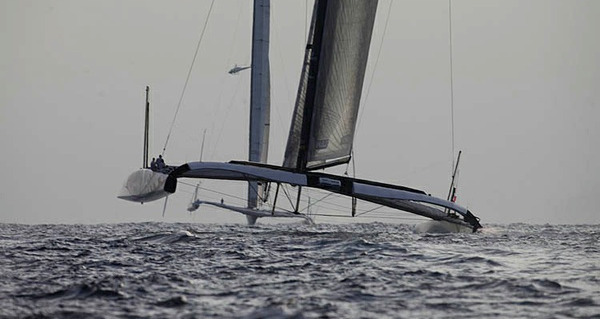 Alinghi 5 was bleeding water ballast and sailing, on a relative basis, better against her opponent than on the first reach. The American team sailed into lighter breeze and was forced to head up and increase the camber of the wingsail as the main hull stopped flying. They were coming to a gybe point, and Alinghi was flying in with pressure from behind, but there was nothing in it. USA had a huge lead. Alinghi 5 was still carrying a penalty. With his hostile challenge and gut-level determination to see through a Deed of Gift match if need be, Larry Ellison led our sport into a wilderness of two and a half years, blowing a hole in the development of professional sailing but promising to rescue the Cup from a future that I agree we didn’t want. Had he lost here, I don’t know how he could have excused himself. Now he shoulders the burdens of the Defender of America’s Cup. Assailing the Defender is one of the great traditions, and as we take our first steps into a brave new world, I have no doubt that my colleagues stand ready. OK, Mr. Ellison, show us.